A treehouse is like a castle for the kids it was like this also for me, my sister and my cousins, no adults were allowed to come in! 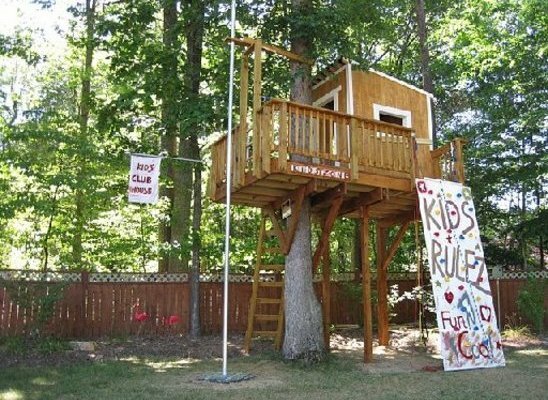 A simple treehouse, where from downstairs you can’t see inside. No adults. Kids Rulez. What happens inside, it stays inside, like in all the best and famous secret clubs. A fireman’s pole to reach the floor and a big terrace to watch and control the situation around. The contrast between the white frames around the door and the window and the warm color of the wood, increase this sense of fort and impenetrability.